The Japan Aerospace Exploration Agency announced earlier this week that the agency’s Akatsuki Venus Orbiter successfully completed its last-chance orbital insertion maneuver and was tracked close to the expected orbit around Venus, saving a mission that had been feared lost after the spacecraft had missed its first opportunity of entering orbit around Earth’s neighbor planet. Regular observations by Akatsuki will begin in April 2016, but the instruments are already collecting data and multi-band imagery from the highly elliptical orbit of the spacecraft. 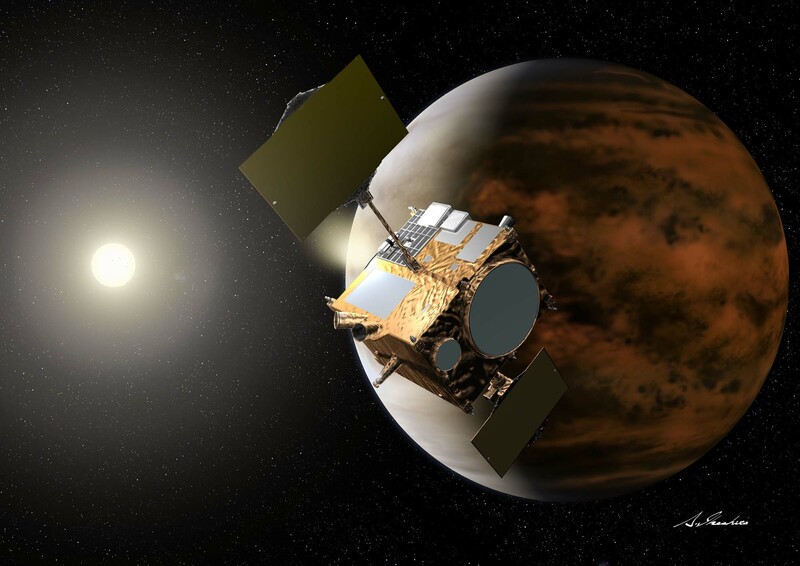 Akatsuki was inbound for Venus Orbit Insertion (VOI) in December 2010, but its main engine burn fell short when the engine was starved of fuel and ran in an oxidizer-rich environment creating a much hotter combustion that led to damage to the engine and an emergency shutdown. The failure was eventually traced back to a balky valve that got stuck in the closed position and did no longer deliver pressurant gas to the fuel system. 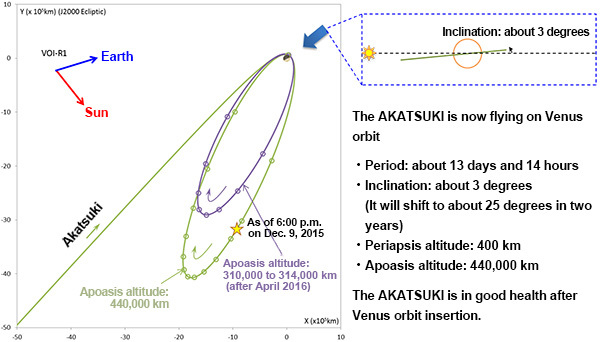 Left in orbit around the sun, Akatsuki faced an alternate mission of circling around the sun for five years before getting a second chance of getting into Venus orbit. With its main engine no longer usable, Akatsuki (“Dawn”) relied on its small 23- and 3-Newton thrusters to maneuver back to a path towards Venus. The small thrusters were again tasked with heavy lifting on Monday when Akatsuki conducted a 1228-second burn to enter a highly elliptical orbit. Mission Controllers were able to confirm that the thrusters fired at the expected time of 23:51 UTC on Sunday and that Doppler tracking of the spacecraft showed the expected change in velocity, however, confirming whether Akatsuki actually achieved orbit was expected to take several hours of radio ranging measurements. On Wednesday, JAXA confirmed that Akatsuki had achieved an orbit of 400 by 440,000 Kilometers – closer to the planet than initially expected. The Mission Team will gladly accept this slight overperformance as it puts the spacecraft closer to Venus and allows it to complete one orbit fast than planned, although some tweaking of the orbit may be necessary in the future. Aiming for a 15-day orbit, Akatsuki achieved an orbit with a period of 13 days and 14 hours, inclined 3 degrees. 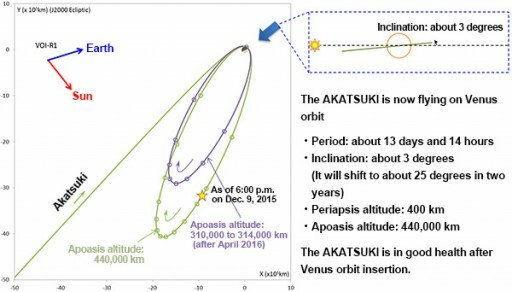 The reason for the lower-than-expected periapsis altitude was likely a slight error in the VOI periapsis with Akatsuki passing closer to Venus than the initially calculated 550 Kilometers, leading to a greater delta-v generated by the burn. One concern with this orbit is the time the spacecraft spends in eclipse given its batteries have been in operation over five and a half years and experienced thermal environments they were not designed for, leading to some degree of degradation. Therefore, teams are looking at the option of slightly adjusting the orbit to eliminate these concerns. Confirmed in a stable orbit, Akatsuki is now the only active spacecraft at Venus after Europe’s Venus Express craft ran out of fuel late last year and burned up in the atmosphere early in 2015. Now safely in orbit, having already exceeded its 4.5-year design life, Akatsuki is hoped to deliver scientific data, going through a test science phase from January to March followed by an orbit-lowering maneuver in March to enter a nine-day orbit around the planet for what is hoped to be a two-year science mission. 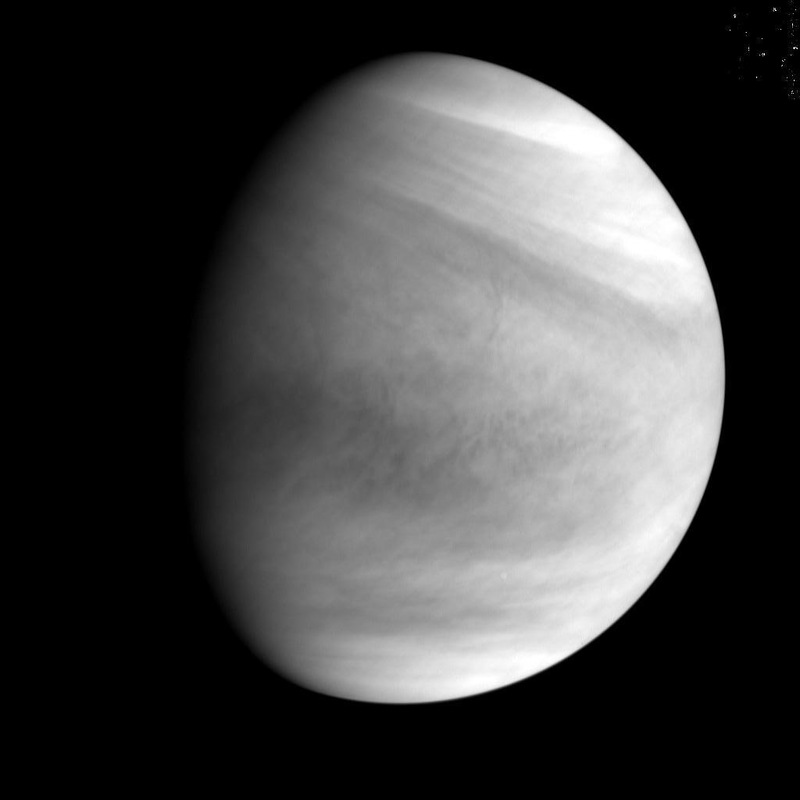 Orbiting Venus in an elliptical orbit provides Akatsuki with the ability to make very detailed observations when close to Venus and study dynamics on a global scale when at greater distance. The spacecraft sets out study the dynamics of the atmosphere of Venus with particular interest in the upper atmosphere’s super rotation and the three-dimensional motion in the lower atmosphere, using a suite of six instruments comprised of five multi-band imagers covering the ultraviolet, visible and infrared wavelengths and a radio science experiment. 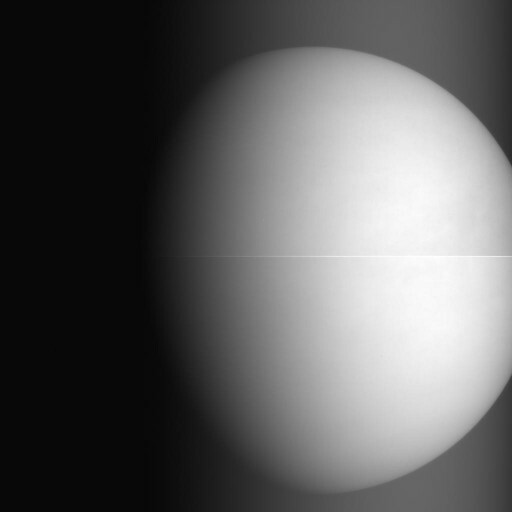 In most planets, the atmosphere circulates slower than the rotation period of the planet, but on Venus the picture is reversed which is one of the items to be studied by Akatsuki. 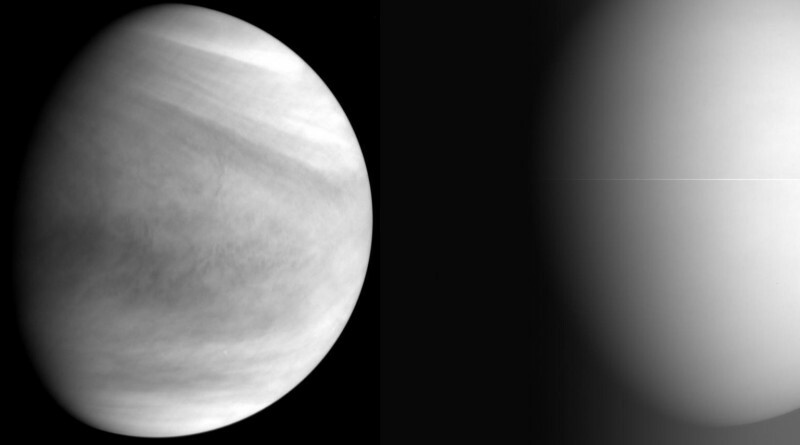 Three of Akatsuki’s instruments are already in operation and delivering imagery of Venus in the ultraviolet, one-micron infrared and long-wave infrared bands. The other instruments, the two-micron infrared imager, the Lightning an Airglow Camera and the radio science instrument are still to be commissioned in the coming weeks.